I wouldn't normally think to make a weeknight pasta recipe with two homemade sauces, but this dish is so delicious that it is more than worth it. Plus, both sauces are super easy to prepare -- they're basically just dump and mix. The first one is a pumpkin cream sauce flavored with Parmesan and lemon zest. Everything just gets mixed together and then simmered a few minutes to melt the cheese and cook the egg. 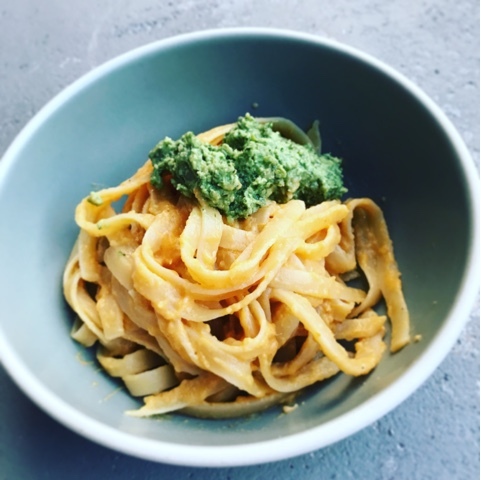 The richness of the cream sauce is cut with a pepper-y, garlic-y pumpkin seed pesto made with arugula in place of basil. You could easily substitute another green such as spinach, kale, or leafy herbs. The two sauces are amazing together, and they pack lots of veggies into a pasta dish. Yum! Fair warning: the cream sauce loses some of its creaminess and doesn't look as appetizing in leftovers the next day, but it is still really tasty. 1. Cook the pasta according to package instructions, but stopping about 1 minute short of the final cooking time since the pasta will cook a minute longer in the sauce. Reserve 1 cup of the pasta water before draining. Drain and set aside. 2. Meanwhile, whisk all the cream sauce ingredients together in a bowl, seasoning with salt and pepper. When the pasta is done cooking, whisk in the pasta water. Return to to the pot used to cook the pasta, and place over medium heat. Stirring constantly, bring to a simmer and cook for 2-3 minutes. Return the pasta to the pot, and cook for another minute, stirring, until the pasta is al dente. 3. Combine all the pesto ingredients in a food processor, and pulse until the mixture is the texture you like. This is a little stiffer than some other pestos, so you can add more olive oil if you prefer a looser sauce. 4. Top each portion of pasta with a spoonful of pesto. Yum! I recently picked up a copy of Mighty Salads from the library and was really impressed with the variety of different recipes! This particular salad really caught my eye and it turned out to be delicious! The base of the salad is kale (we picked up a bag of baby kale from Trader Joes), and the hearty greens stand up well to a variety of toppings -- roasted sweet potatoes, toothsome wild rice, salty cheese, and tart green apples. The only part of this salad I didn't love was the roasted tofu -- it's definitely the most work/time investment, and I didn't feel like the flavor and texture was that amazing. I ate my leftovers the next day with avocado subbing in for the tofu and preferred that version; rotisserie chicken would also be tasty if you're not vegetarian. The absolute best part of this salad was the dressing. It's got all the usual things I put in a quick homemade dressing -- Dijon, vinegar, olive oil, honey -- but with one big extra. A large shallot is roasted in a foil packet alongside the sweet potatoes, and then blended into the other ingredients. This makes the dressing wonderfully creamy with no dairy, and just amps up the flavor. I only wish it had made more! Next time I will definitely double this dressing -- so good. 1. If making the tofu, wrap in paper towels, place on a plate, and top with something heavy. Allow to drain for 30 minutes or so. Discard the paper towels, cut into 3/4-inch cubes, and place in a shalow dish. 2. Whisk together the vinegar, Dijon, and honey, and pour over the tofu cubes. Marinate 30 minutes to 1 hour. Drain and discard the marinade. 3. Preheat the oven to 400 degrees and line 2 medium or 1 large baking sheet with foil. Spray with oil. 4. Arrange the tofu in 1 layer and brush with olive oil. 5. Place the thinly sliced shallot on a square of aluminum foil, drizzle with oil, and sprinkle with a little salt. Fold up to make a packet. 6. Toss the sweet potatoes with olive oil, salt, and pepper. Arrange in a single layer either next to the tofu or on a separate sheet. Tuck the shallot packet in a corner and roast for 35-40 minutes, rotating the baking sheet(s) halfway through. 7. Meanwhile, cook the wild rice according to package directions. 8. When the shallots are cooked, place in a blender with all the other dressing ingredients and blend until smooth. You can also use an immersion blender. 9. 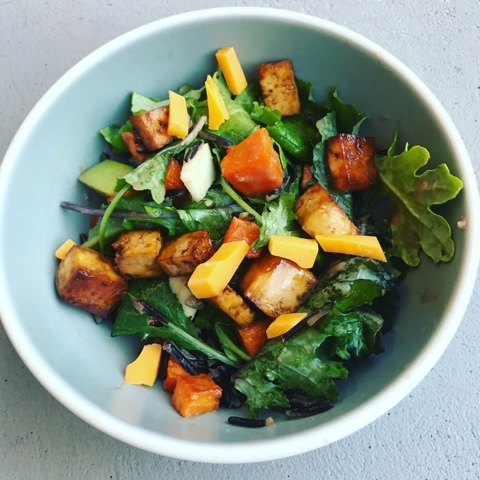 Assemble the salad -- toss some kale with the dressing, and top with the wild rice, sweet potato, cheddar, apple, and tofu. Drizzle more dressing on top. Yum! 10. If packing leftovers for lunch, keep the cheese and dressing in a separate container until ready to eat.